Vestibular neuronitis is a sudden disease of the vestibular apparatus, which is not dangerous for human life. The main symptoms are acute dizziness with nausea and vomiting, the inability to move independently due to instability. When such symptoms happen to a person, of course, it feels scary, and the person first rushes for medical help. In addition to vestibular neuronitis, a similar clinical picture is observed with a number of other neurological and significantly more dangerous diseases. Only a competent specialist can distinguish them, and sometimes additional research methods are required for this. For the first time, these symptoms became known to the world back in 1909 thanks to Eric Ruttin. But the medical community became available only in 40 years – in 1949, when the American otorhinolaryngologist Charles Hallpike suggested the term “vestibular neuronitis” and gave a detailed description of the symptoms of the disease. The role of viruses in the occurence of vestibular neuronitis is practically undeniable at the present time. The fact is that often the symptoms of the disease occur one week after the acute respiratory illness. In addition, vestibular neuronitis is characterized by an epidemic surge in incidence at the end of spring. The cases of occurrence of disease among members of one family with a small interval of time are described. 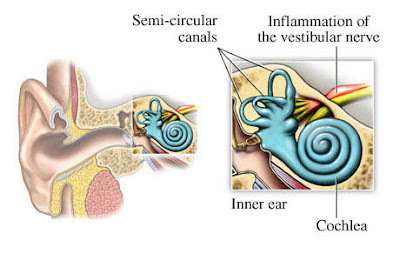 Sometimes the cause of the development of the disease remains unknown, which indicates the end of the unstated nature of the vestibular neuronitis. Most often, the vestibular neuronitis appears suddenly against a background of seemingly full well-being. The patient has a sharp dizziness, because of which he may even fall. Vertigo is vestibular, which is associated with the defeat of the vestibular nerve itself, characterized by a feeling of rotation of one’s own body in space, by rotating objects around, by falling through or throwing up. Dizziness lasts from several hours to several days, with a tendency to gradually decrease. Symptoms are aggravated by movements of the head and bends of the trunk. But when fixing a glance at one point, dizziness decreases. A few hours or days before the occurrence of such prolonged dizziness, patients may experience short-term feelings of failure or diziness, which are less intense than the main attack. an instability in the Romberg pose. If the patient is placed in a vertical position, the legs are put together, the arms are extended forward to the horizontal level with the palms facing down, the eyes are closed, then the patient cannot hold such a position independently. Most likely the patient will deviate (fall) towards the affected nerve. As the symptoms of vestibular neuronitis decrease, stability in Romberg’s posture returns, but if you put the patient in a complicated Romberg pose (when one leg is exposed in front of the other in a straight line and the heel in front of the standing leg touches the toe of the rear leg), then the deviation to the affected side still will persist. 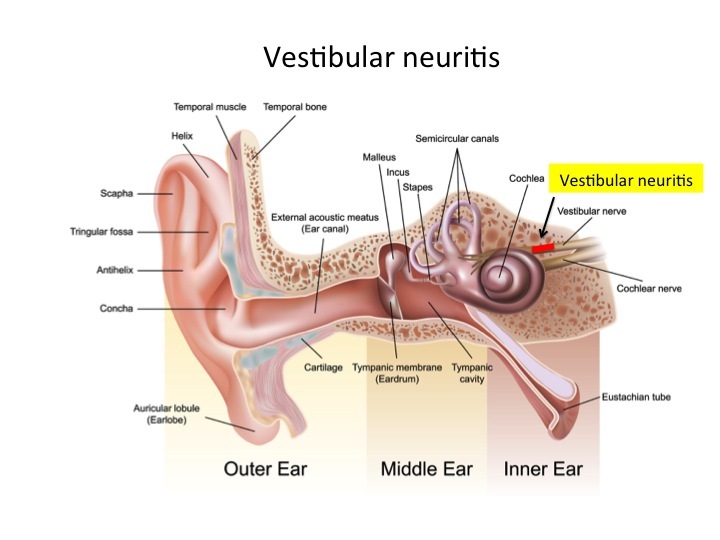 Since the vestibular neuron is affected only by the vestibular nerve, there is never a change in hearing. This feature of the disease is an important diagnostic moment. With other pathologies of the nervous system and the vestibular apparatus, hearing loss and the appearance of additional symptoms are possible. Vestibular neuronitis is never accompanied by additional focal symptoms, since all other structures of the nervous system are not affected. Enhanced dizziness with nausea and vomiting usually lasts from several hours to several days. Then gradually the patient gets better. For about two weeks, dizziness remains, and sometimes patients experience nausea. Then for some time the patient feels some instability and unsteadiness while walking. 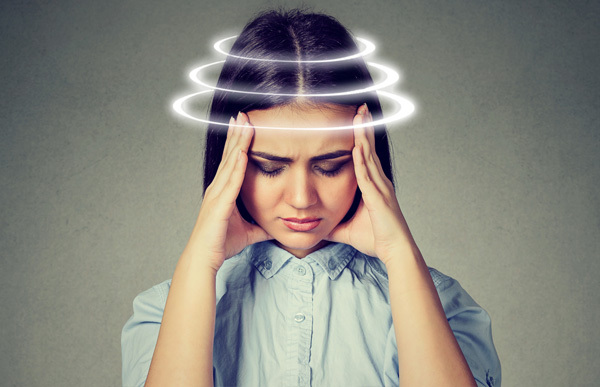 If all the symptoms go away within 6 months, then the vestibular neuronitis is considered acute, but if they continue to persist, then it is the chronic course. The timing of recovery from vestibular neuronitis is different. This depends on the completeness of the treatment received, and on the individual sensitivity to the drugs of the individual patient, and on the stability of the vestibular system as a whole. Very rarely patients (approximately 2% of cases) experience this condition again. In such cases, the other side is affected. 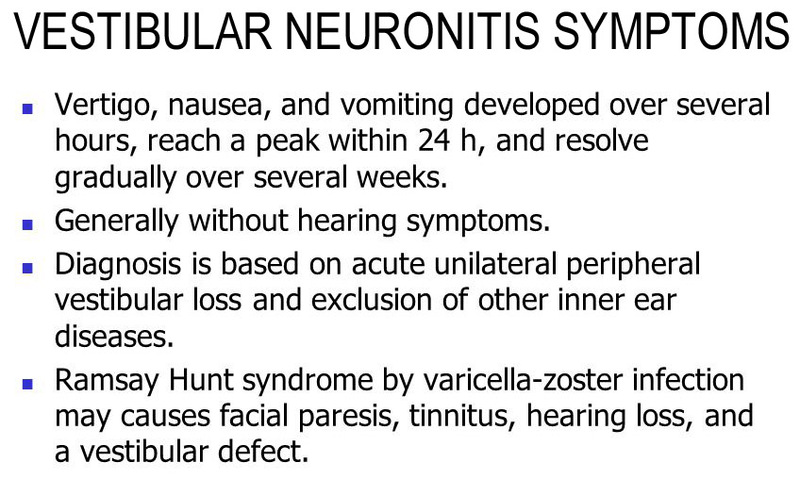 Vestibular neuronitis is considered a disease that is difficult to diagnoze. To establish such a diagnosis, a careful history (including information on the diseases preceding the symptoms of the vestibular neuronitis), careful examination of the patient, and a number of additional methods of investigation are required. duration of dizziness from several hours to several days without increasing symptoms and further deterioration of the condition. To confirm the diagnosis, a caloric test is conducted. Its results indicate a unilateral lesion of the vestibular nerve (its upper part). The modern method of diagnosing the lesion of the vestibular apparatus, including the vestibular neuronite, is caused by vestibular myogenic potentials. The method is completely painless and harmless, which is important. With the vestibular neuronitis, magnetic resonance imaging of the brain can be performed. This is due to the need for differential diagnosis of the symptoms of vestibular neuronitis, for example, with cerebrovascular disorders in the vertebro-basilar system. diuretic drugs that reduce edema of nerve fibers. Usually, the combined use of these drugs allows a few days to reduce the severity of the main symptoms of vestibular neuronitis. After the disappearance of nausea and vomiting, dizziness significantly decreases, they proceed with a non-medicamental method of treatment – vestibular gymnastics. Complete recovery of the vestibular function occurs in a year in 40% of patients, in 30% recovery is partial. The remaining 30% of patients fall into the category of patients with unilateral impairment of the vestibular apparatus, which persists further. However, when performing vestibular gymnastics, the processes of central compensation take precedence over the residual phenomena of the disease, and the patient does not experience significant problems with coordination and balance. Thus, the vestibular neuronitis is a disease of the apparatus of balance and coordination of movements. Most often, the disease is a consequence of viral damage to the vestibular nerve. The main symptoms are acute dizziness with nausea and vomiting in the absence of hearing impairment. To eliminate the symptoms of the disease, drugs and vestibular gymnastics are needed, allowing you to train the vestibular apparatus and make it more resistant to irritants. The prognosis for recovery is favorable in most cases.